Something that happens to me more than I'd like to admit; I see other bloggers wearing a particular item of clothing so much, (on instagram, pinterest, and of course, other blogs), that I start to think I also own that piece of clothing... even when, in fact, I do not. That was the case with a grey off-shoulder sweater. 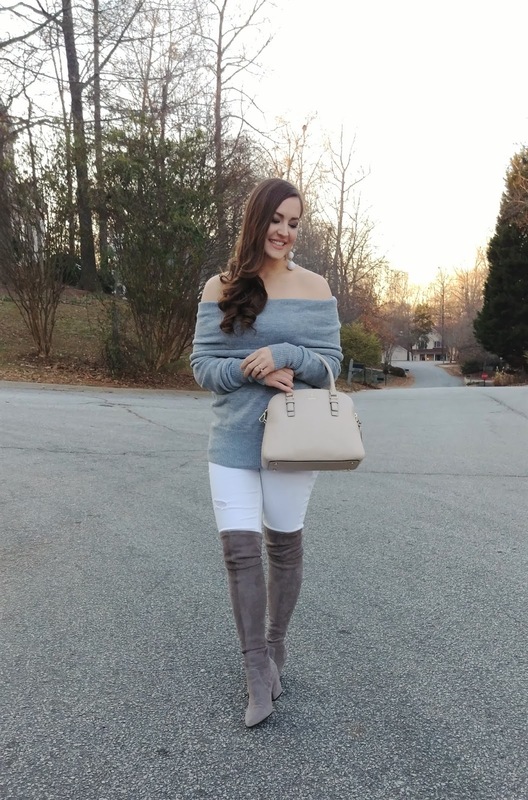 I saw grey off-shoulder sweaters so much on instagram this Fall and Winter, that I was on my way to my closet to put an outfit together, only to realize, I do not yet own this sweater. Well, that had to be remedied. How am I expected to live without owning such a crucial piece of clothing!? hahaha So, that's how I came to purchase this cute little top. I love it, and I definitely recommend this as a staple in your Fall and Winter wardrobe. Very cozy, chic, and easy! Thanks so much for stopping by today!! It's FRIDAY!! Oh, and you may have noticed that my website is looking very different! I'm in the process of changing the layout, and I'm not sure I'm completely done yet, but I thought I was close enough to go live with the progress I've made. I've been working so hard on this, and I hope you love it! Thanks for reading and have a wonderful weekend! love how you styled this grey sweater. Beautiful earrings as well. Such a romantic and feminine look altogether. There is something so soft and romantic about it. Thank you, Ivana! I really appreciate that. Love this grey jumper! Looks great on you! Super cute sweater & earrings. You have the prettiest smile! I love that sweater! It's been popping up all over my IG too and I wish I owned it. You styled it perfectly. Thank you Caitlin! I appreciate that so much! Thank you so much, Isabela! Love this outfit! You know where you can find A TON of such amazing-ness in knock-out prices? The EverySale app (been forever broke since the day I discovered it)! How great for you Melissa!